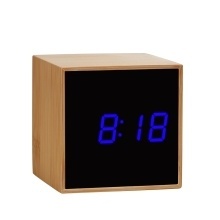 This product is not only a clock but also a good decoration for your table. 2 ways power source supply, USB powered or batteries powered. Snooze interval time can be set from 5-60 minutes as you need. The clock tread on the world that runs silently, never disturb your dream. When the function is on, it will automatically turn off the display after in seconds, easy to awake it by making some noise higher than 60dB. Perfect for home, school, office, travel, etc use, also could use as a small clear mirror.